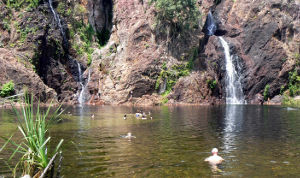 Litchfield National Park - waterfalls, rockpools and aboriginal culture. Darwin's playground, Litchfield National Park is close enough to visit simply to swim in a cool waterfall rock pool and enjoy beautiful tropical forests. 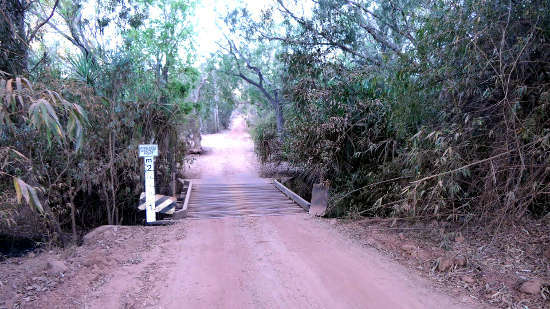 The park is accessed by sealed road from the Stuart Highway through the town of Batchelor, about an hour's drive (112k) south of Darwin. Look for the Batchelor turn-off, it's hard to miss! There is a shorter, unsealed road via Berry Springs which is open in the dry season. And many people from Darwin visit, packing an esky with snacks and drinks and heading off to Wangi Falls, Florence Falls or any of the other swimming spots in the park for a day of adventure and recreation. While heavy thunderstorms can sometimes close roads and swimming at the peak of the wet season, most popular picnic and swimming areas are accessible by sealed roads from the Batchelor entrance to the park. If the road is flooded be very careful and don't check the depth by wading into the water, this is crocodile country! Only recognised swimming pools are safe, and then only because they are checked by rangers. 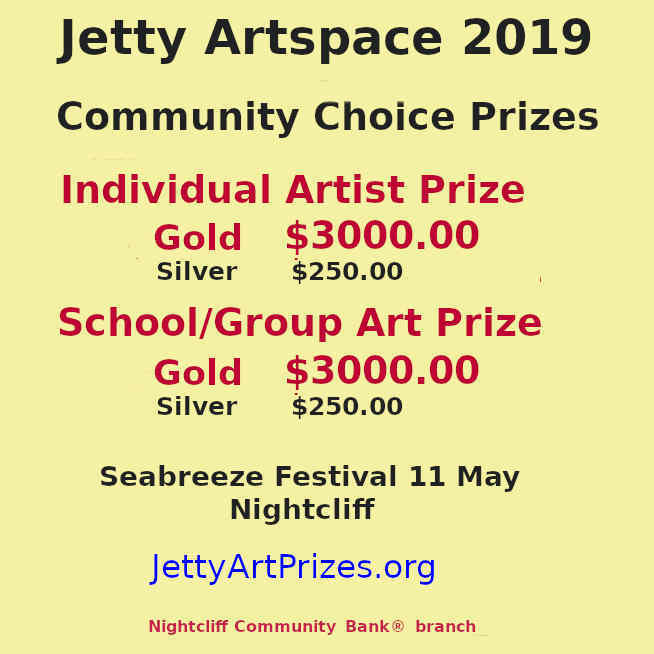 Check latest information on access here. Litchfield is well known for the great diversity of birdlife that can bee seen in the park and nearby areas. 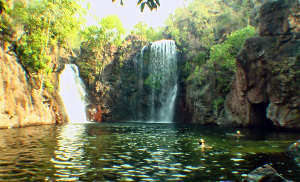 Florence Falls is another popular swimming pool, you can see swimmers as a couple of small specks at the base of the waterfall on the right. 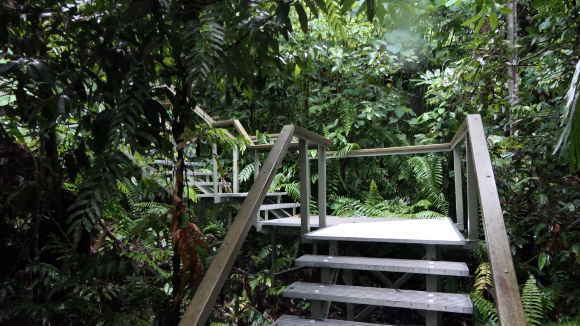 There is a staircase leading down to the base of the falls, with toilets and an information board at the car park. Have you been to Litchfield Park? Tell us all about your visit in the Visitors Book. Simply click here and type in your story. Read other Visitor Book entries here. 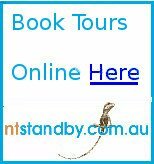 Accommodation in Litchfield Park is limited, however there are several caravan and camping parks within a few minutes drive, and some have quite comfortable cabin style accommodation. Read more about Litchfield Park Accommodation here.. The road from Wangi Falls to Berry Springs still has about 40k's of unsealed, corrugated dirt road, and is completely cut during the wet season by flooding at the Finniss river. Check the signs at Wangi Falls or ask at Berry Springs before you travel, or you may be forced to turn back at the river. Finniss River - the rise in the distance is the other river bank during floods. Note there are no rails on the sides of the steel crossing so even a shallow amount of water flowing over the bridge could wash a vehicle off. A small weir just upsteam from the bridge makes a picturesque setting in the evening light. You can see concrete at the base of the trees on the right of the photo. Finniss River reflections in the evening light. 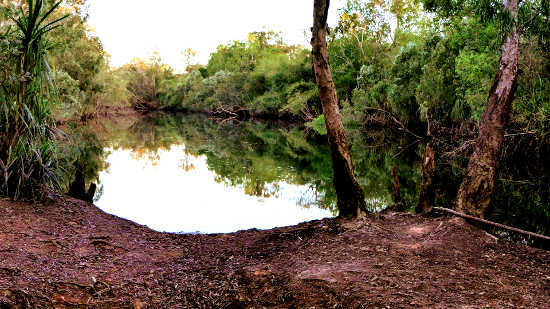 Before you are tempted to cool off with a quick dip in the billabong, check this shot of the weir. 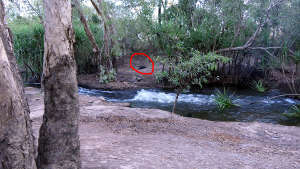 Notice the black spot on the far bank circled in red, just above the white water. It's a bit clearer with the aid of a telephoto lens. This is a saltwater crocodile, by my estimate a bit over 3 m long and quite capable of taking an adult person. 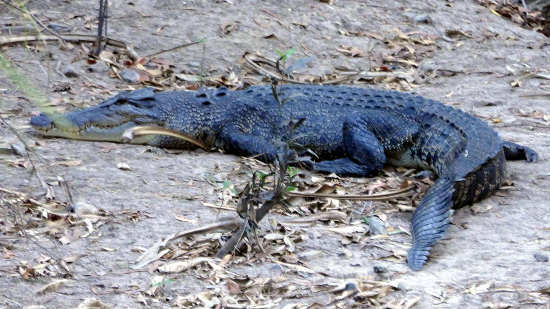 People camping nearby told us two more crocs had been seen in the water upstream, this is crocodile country. Return from Litchfield National park to Enjoy Darwin Home.